Worshippers at the Cathedral Church of Our Lady Help of Christians and St Peter Alcantara in Shrewsbury will be more than acquainted with the magnificent west window depicting Ss Edmund, Alban, Winefride, Oswald, Thomas Becket, John Fisher, Thomas More, John Houghton, Edmund Campion, and Blesseds Margaret Pole and John Forrest. These are the works of the marvellous Margaret Rope. We too, here at Tyburn Convent, London, just yards from the site where 105 canonised and beatified Catholic martyrs met their deaths, are equally acquainted with her works, having the privileged custody of 20 panels she created for our Martyrs’ Crypt. Margaret was born on 20 June 1882 in Shrewsbury and died 71 years later on 6 December 1953. Her father, a doctor, was a High Church Anglican and determinedly anti-Catholic. But the mother and all but one of the six children converted to Catholicism after his early death. Margaret was by nature devout and in 1923 she entered the Carmelite order, spending her final days at Quidenham Carmel. Very early Margaret also manifested exceptional artistic talent. From 1900 she attended the Birmingham Municipal School of Art. 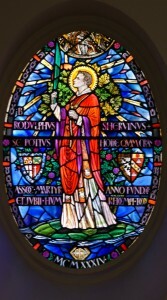 Henry Payne guided her studies in the art of stained glass. At this time she already attained artistic fame, winning scholarships and many awards in the National Competition for Schools of Art. Above all, her stained glass art was marked by a deeply religious inspiration. As with all creative artists, Margaret left her indelible mark upon her work. Increasingly, a special “image of God” – the reflection of God’s creative gift to her – shines through her artistic creations. So let us pursue and ponder the inspired imprint of Margaret’s creativity in stained glass in two of her finest gifts to the Shrewsbury Catholic community. The height and depth, the length and breadth of Margaret’s spiritual vision is revealed in the West Window of the cathedral. It is a window on to the universal dimensions of our holy religion, portrayed on several distinct but inter-related levels. At the apex is the symbol of Christ as the Lamb, slain yet standing above the heavenly Jerusalem, in the heavenly firmament. Below the entire universe is found – the vast oceans, celestial lights – sun, moon and stars; dry land, plants, seed-bearing trees with fruit; song birds and flying birds. Then too the angelic choirs and heavenly song: this is the full chorus of creation praising God. The ever-present witness of the Church follows on the next level below with the depictions of the 11 English martyrs. They are the witnesses and fruits of the holiness gathered from the earthly – and English – Church as seen in glory with their halo-crowned heads. They are men and women from every walk of life, radiant with holiness, gazing upward to the unveiled divine glory. On the level beneath these saints Margaret has captured the earthly cost of their religious witness – martyrdom. These figures are the pride of our English Catholic faith. Just to gaze upon them amid their tortures – heinous and barbaric – awakens a deeper faith commitment within our soul. But for them, where would we be today? Two of them are Tyburn martyrs – and this brings us to ponder the Congress Window, panels of which are pictured above, produced for the Eucharistic Congress in London in 1921 and which contrasts the freedom of Catholics to worship with martyrdom at Tyburn during the Reformation a few centuries earlier. The overall shape and style of the window is similar to that of the West Window. But in this window Margaret’s “martyr” spirituality radiates more graphically in a transformative manner. Additionally, the very English humour of Margaret finds its place. 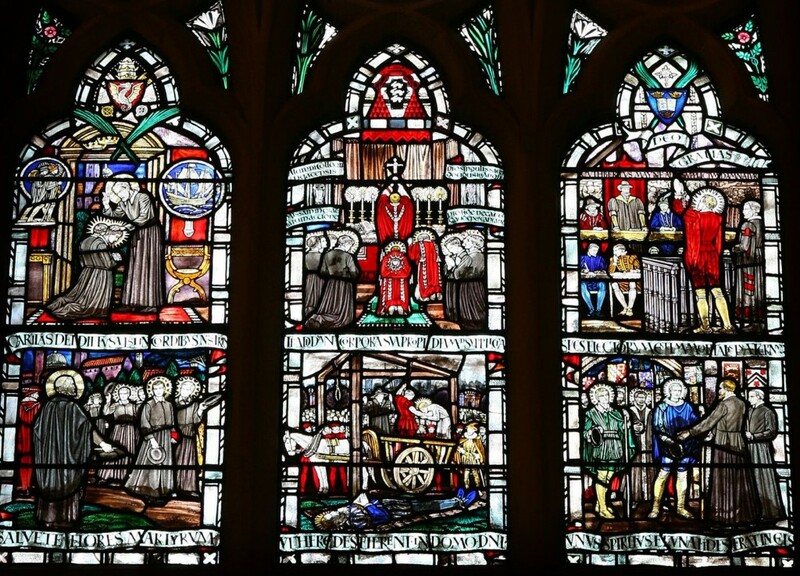 The three large bottom panels are all linked visually to the English College, Rome, where so many English and Tyburn martyrs were trained for the priestly orders and martyrdom. Margaret presents the students/martyrs all of them already each with his halo. They are saluted outside the English College by St Philip Neri as he emerges from the Church of San Giralomo Della Carita opposite. Latin inscriptions tell their story. SALVETE FLORIS MARTYRUM from a line in the hymn for the holy innocents haling the flowers of martyrdom. Another scriptural verse tells of the love of Christ poured out in our hearts. While another proclaims that these holy martyrs remained united in “one spirit and one faith”, in their holy mission. The centre panel shows St Ralph Sherwin – the first martyr of the English College – ascending the Tyburn gallows, and kissing the executioner’s hand – wet with the blood of St Edmund Campion – while St Alexander Briant still lies bound to the hurdle on the ground beneath (the picture to the right shows Margaret’s depiction of St Ralph in the English College, with his halo the same as that in the Congress Window). Directly above them at the English College other priests and students are celebrating the holy sacrifice of the Mass – on learning the news of their martyrdom. Cuthbert Main with his manacled hands, in the third panel, on hearing his condemnation, raises his hands crying out: “Deo Gratias,” which Margaret depicts in large letters above his head. Between these two panels we find Margaret’s depiction of two Tyburn nuns praying in adoration, with the Invitatory Antiphon taken from the Vigil Office of the Liturgy of the Hours, in Latin, COME, LET US ADORE THE LORD, THE KING OF MARTYRS. A little higher, above their heads is a monstrance containing the Blessed Sacrament, surrounded by brightly burning candles – Eucharistic adoration being made freely in England. Next, to the left, there is what looks like the first floor balcony at Tyburn Convent with the vested priests and two servers, giving Benediction of the Blessed Sacrament as is done annually after the Tyburn Walk. – with a large crowd of faithful people kneeling in worship and adoration on the street below. A little to the right is the panel in stained glass of a scene never portrayed in any English religious stained glass. The left half of this panel is a continuation of the Tyburn first floor balcony with a group of kneeling worshippers. Impinging hard upon them stands a blue-clad London bobby, tall and erect with arms outstretched holding back a large double-decker red London bus. To cap it all, these last two panels are inscribed – MAIUS MCMXXI – May 1921 (that is to say it commemorates the 1921 Eucharistic Congress in London that May!). Only an English woman could add in that touch of wit to the arrival of freedom of worship in the country after the long, dreary years of persecution and the penal days. Margaret Rope, humourous genius. Fittingly the artist places MARY, QUEEN OF MARTYRS at the highest point of the Congress Window, invoking her prayers for our country. Truly we can see and say that the “blood of the martyrs is the seed of Christians”. Margaret Rope, in bequeathing these artistic treasures to Shrewsbury Cathedral, is at the same time displaying her religious artistic genius and the rare quality of beauty and depth of her own spiritual pilgrimage through this mortal life to the gates of heaven. May we all be sensitive enough to cherish and follow her exemplary Catholic witness in our own life’s journey. 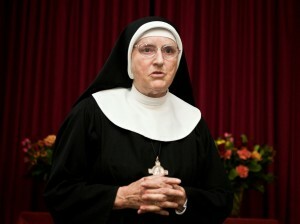 Mother McMonagle (pictured) is the Mother General of the Adorers of the Sacred Heart of Jesus of Montmartre, also known as the Tyburn Nuns. This article first appeared in the Lent/Easter 2012 edition of the Shrewsbury Catholic Voice.